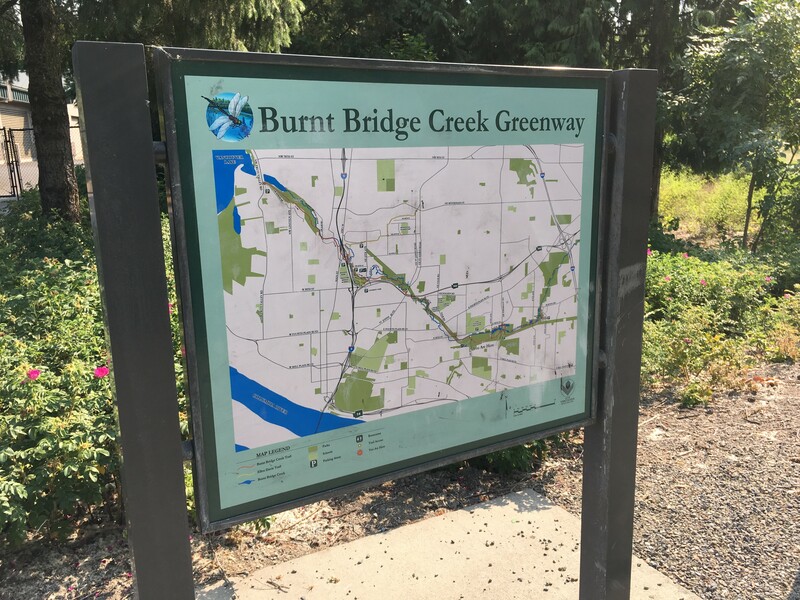 Today many of us walk or ride bikes on the Burnt Bridge Creek Trail, an 8-mile swath of green that cross sections a large portion of the City of Vancouver. On the west, the trail begins at Stewart Glen Park, near its mouth at Vancouver Lake. The park has some parking there for those who use the trail. On the east side it ends at Meadowbrook Marsh, at 90th Avenue and Burton Road. The creek itself, for which the trail is named, rises near Orchards, draining fields and woods. Cold Creek is its main tributary. Unfortunately, in order to tame the creek, the Corps of Engineers straightened it out. On its east end, it flows geometrically straight. This work was almost catastrophic for the creek. The water warmed and ran too fast. Native plants withered, beaver left, and fish declined. On the west half of its 13-mile run, its flow has been allowed to return to a natural meandering. Fallen trees have been added to the stream to encourage fish and wildlife. Bare trunks were set up to encourage raptors to nest. Once this creek was known as Stenegier’s Creek. John Stenegier was a Scot, from the Orkney Islands, who came to the wilderness that was Fort Vancouver when he was 26, and here he stayed. He helped to rebuild a mill on the creek, but that didn’t last long. The Columbia River gave a mightier drive to a mill which would be built upriver from the Fort, on an open plain, the Mill Plain. Stenegier spent the rest of his life here, remaining after he retired from the Company. When the budding little town of Vancouver City began to form, a Water Company incorporated to draw water from Stenegiers Creek. It remained the main source of water for the town many years. Eventually the springs above the Army reserve replaced it. In the late 1850s a new name for the creek appeared on maps: Marble Creek. Common history has said that it was named for Ansil Marble who had a mill on the creek. The Marble family was a prominent one and had many property holdings and businesses. The historical problem is that Ansil Marble’s mill was on Salmon Creek, not Stenegier Creek. His father, Butler Emrey Marble, however, did live on the Stenegier Creek. He had filed a claim for land which today would run from 39th Street north to 56th Circle, from Washington Street to Leverich Park Way. Butler E. Marble was a veteran of the War of 1812. He enlisted in the Washington Volunteers during the Indian Wars, but was mustered out two months later due to old age and frailty. He and Ansil built several mills. They built a sawmill on Burnt Bridge Creek at Cold Creek, and a grist mill on Salmon Creek. The road from St. James Church to St. John’s Mission ran by his holdings. When the water was high in the Spring Freshet, the creek became a serious barrier. A simple wooden bridge was built across the creek. The name Bridge Creek appeared for a short time. The bridge across Marble Creek burned sometime between 1860 and 1865. That was a serious blow to the settlers. The cause of the fire is unknown. The Bridge was quickly rebuilt, but the name Burnt Bridge Creek began to appear on local maps. So, the name remains today.